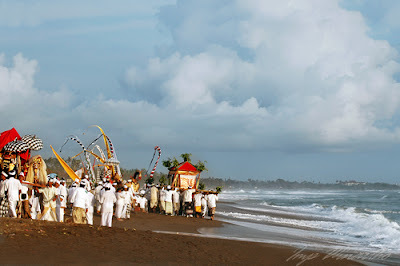 Nyepi is derived from the quiet (silent). Nyepi Day is actually a celebration of New Year according to Hindu calendar / Saka calendar, which began in 78 AD. 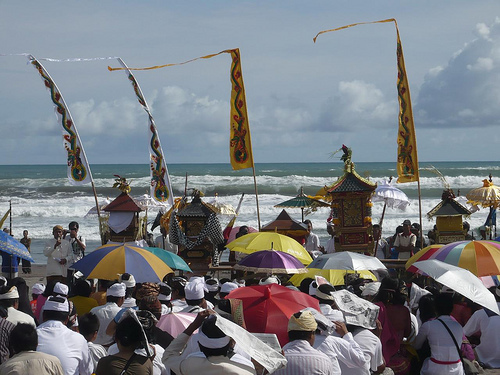 Unlike the new year celebration AD, Saka New Year in Bali begins with solitude. There are no activities as usual. All activity was removed, including public services, such as the International Airport was closed, but not for hospitals. The main purpose of Nyepi is pleading before God Almighty, to purify Buwana Alit (human nature / microcosmos) and Buwana Supreme / macrocosmos (the universe). Before Hari Raya Nyepi, there are several series of ceremonies which the Hindus do, particularly in the area of Bali. 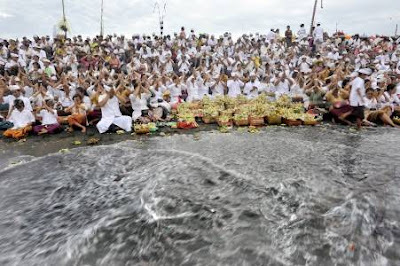 Three or two days before Nyepi, Hindus perform ritual purification by Melasti or also called Melis / Mekiyis. On that day, all the means praying in the Temple (shrine) in the wine to the beach or lake, because the sea or lake is the source of holy water (Tirta Amrita) and can purify all leteh (gross) in man and nature. 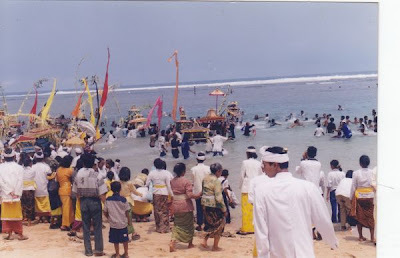 The day before Nyepi, namely the "Tilem sasih Kesanga" (month of death that to-9), Hindu ceremony Blind Yadnya at all levels of society, ranging from individual families, banjo, village, district and beyond, by taking one of the types caru (such offerings), according to his ability. 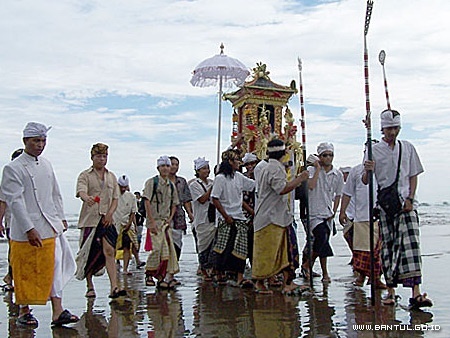 Blind Yadnya were each named Panca Sata (small), Panca Relatives (medium), and Tawur Great (large). 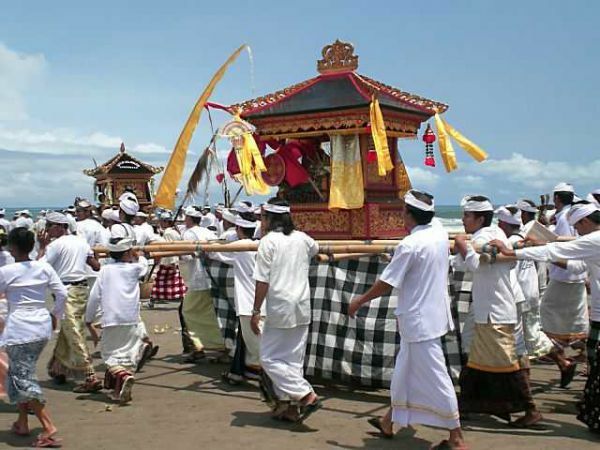 Tawur or pecaruan itself is a purification / pemarisuda Buta Kala, and all leteh (impurities) are all expected to disappear. Caru undertaken at home each consisting of rice abroad (five) colors of 9 duel / package along with side dishes pauknya, such as chicken Brumbun (colored) along tetabuhan wine / wine. Blind Yadnya is addressed to the Blind King, Blind and Batara Kala Kala, by pleading that they might not bother people. 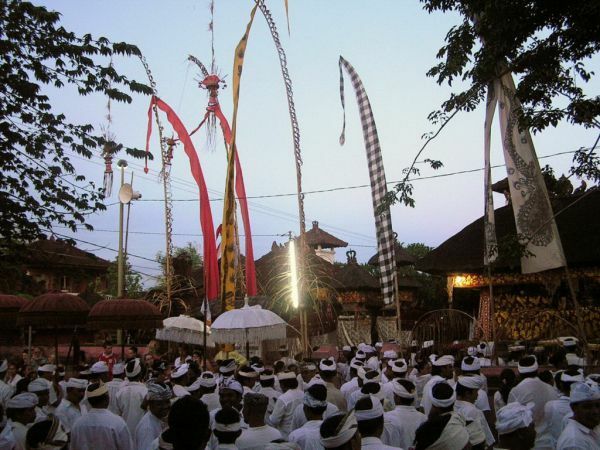 Mecaru pengerupukan followed by a ceremony, which is spread spread tawur rice, torch-obori home and around the yard, menyemburi house and yard with gunpowder, and hitting any objects (usually gong) to speak crowded / noisy. These steps are taken to expel Buta Kala of the home environment, yards, and the environment. 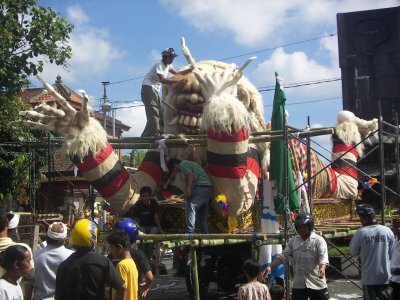 Especially in Bali, pengrupukan usually celebrated with a parade ogoh-ogoh Buta Kala embodies that paraded around the neighborhood, and then burned. Goal is the same which drive Buta Kala from the surrounding environment. The next day, ie on Kedasa Purnama (full moon to-10), it's actually the Nyepi Day. On this day like a dead atmosphere. No busy activity as usual. 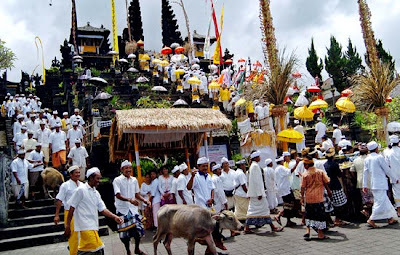 On this day Hindus perform "Catur Brata" Penyepian comprising observe geni (no berapi-api/tidak use and / or turn on the fire), observe the work (not working), observe lelungan (not traveling), and observe lelanguan (not listening entertainment). And for those who can also perform asceticism, fasting, yoga and semadhi. So for the new, completely new start with a clean white page. 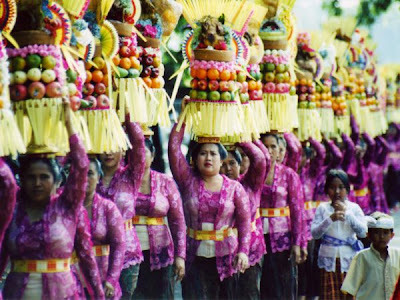 To start a new life in the year Caka anything, this base is used, so that everything we do starts from nothing, pure and clean. 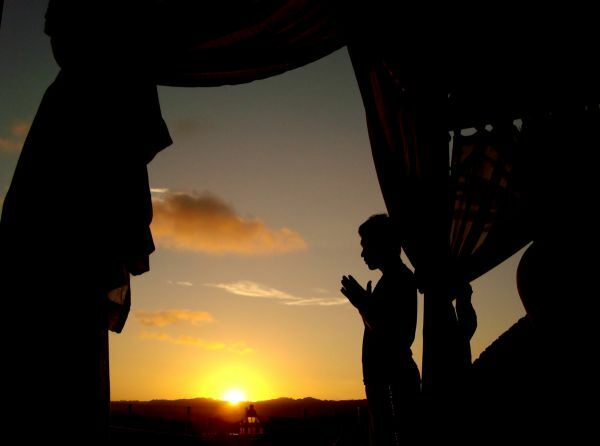 Each person knowledgeable (the wruhing tattwa Jnana) implement Brata (restraining the passions), yoga (connecting people with paramatma (God), tapas (suffering endurance exercise), and Samadi (united to God, the goal ultimately is the sanctity of inner and outer). 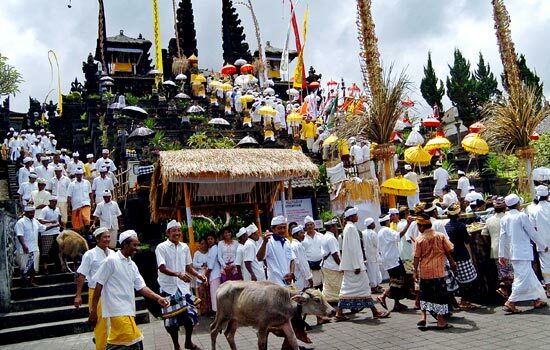 All of it becomes imperative for Hindus to have the mental preparedness to face any challenge life in the new year. 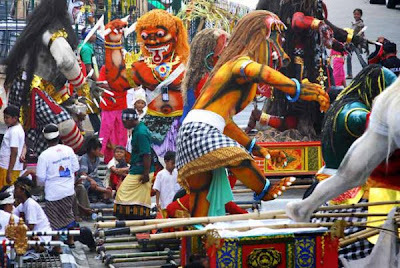 Habit of celebrating the holiday with the pleasure-loving, gambling, drunkenness is something wrong habits and should be changed. The last series of the Saka New Year celebration is a day that falls on Geni Ngembak "ping pinanggal kalih" (December 2) sasih kedasa (moon X). On this day Saka New Year is entering the second day. 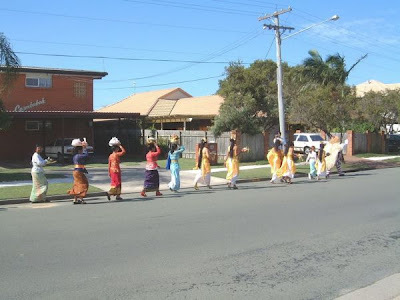 Hindus do Dharma Shanti with large families and neighbors, give thanks and sorry forgive each other (ksama) each other, to start the new year a clean sheet. 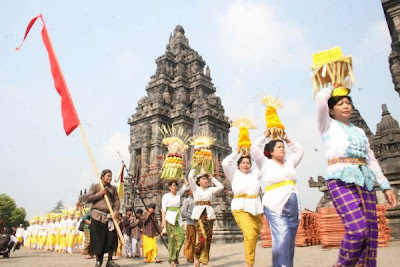 The core philosophy Tattwamasi Dharma Santi is a view that all human beings all over the earth as a creation Ida Sanghyang Widhi Wasa should love each other with each other, forgive all the mistakes and errors. Living in harmony and peace. 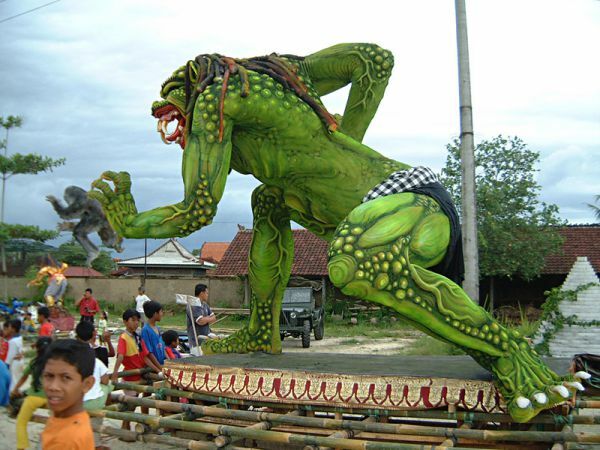 Ogoh-ogoh is a work of sculpture art in Balinese culture is Bhuta Kala describe personality. In Hindu Dharma teachings, Bhuta Kala represents strength (Bhu) of the universe and time (Kala) is not measurable and irrefutable. 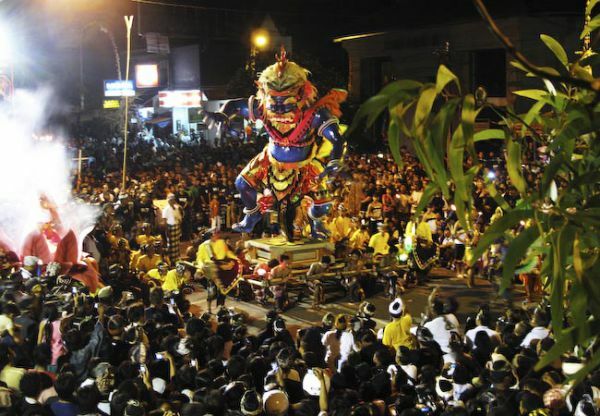 In the embodiment of the statue in question, Bhuta Kala described as large and intimidating figure, usually in the form of Rakshasa. 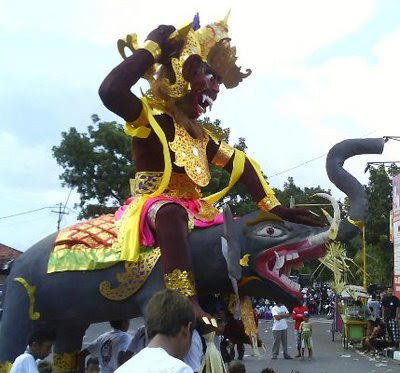 Apart form of Rakshasa, Ogoh-ogoh are often depicted in the form of creatures that live in Mayapada, Heaven and Naraka, such as: dragon, elephant, eagle, Widyadari, even the gods. In its development, there are made to resemble famous people, such as world leaders, artists or religious figures and even criminals. Related to this, there is also the smell of political or racial intolerance, although this actually deviate from the basic principles of Ogoh-ogoh. 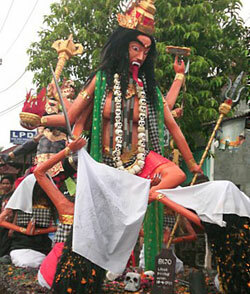 Ogoh-ogoh example depicting a terrorist. 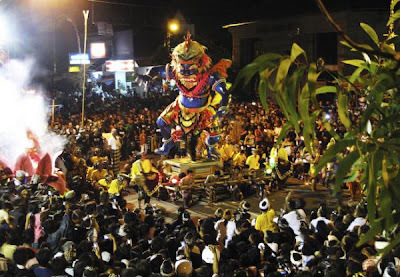 In its main function, Ogoh-ogoh as a representation of Bhuta Kala, made before the Nyepi Day and rollicking paraded around the village at dusk Pangrupukan, a day before the Nyepi Day.